1. 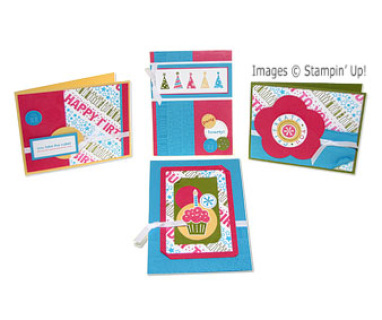 Birthday Builder Wheel Card set - you'll learn to use the new Stampin'Up! Builder Wheels while making 4 cards and a adorable gift box @ Hobby Lobby. Details Below. 2. Wearable Art - Are you looking for the perfect color bracelet to go with an outfit? Do you wish you could be creative? Come on Saturday, September 18th from 1-4 pm at Kittie's Kreations. You'll make a grungeboard bracelet your own unique style and color. Imagine the compliments you'll get when you show it off. The cost is $10/person. You can make an additional bracelet for $5. Register at Kittie's Kreations in Sherwood, www.kittiekreations.com. Click here for details and samples of what you can create. Everyone has a birthday, so this class is perfect for your favorite birthday youngster or just those that are young at heart! 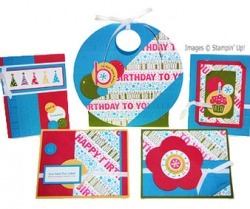 These bright and cheerful cards make a great gift or can save the day when you need a last minute birthday card. Stampin'Up! new Builder Wheels let you customize your wheel any way you'd like. You can stack three, just two, or even one. Not only can you mix and match the wheel artwork, but also the colors. Come give it a try! Registration Form (please pay prior to class, choose link below). All supplies provided for you plus instructions! You take home a circle bag and 4 cards.